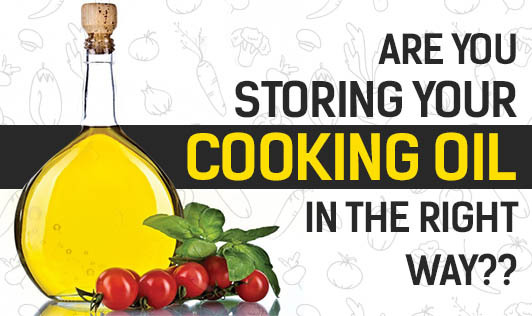 Are You Storing Your Cooking Oil in the Right way?? Fats are an important part of our diet and an essential requirement for our body to carry out it's functions. It forms an important part of our cooking and is an ingredient in almost every dish that is cooked in the kitchen. Most oils are known to have a long shelf life if they are stored under the right conditions. Here are a few important points to keep in mind when you store oil for a long time. • Make sure the container in which oil is stored is tightly sealed, and stored in a cool and dry place. • Oil should not be kept near your gas stove or any heat appliances. • You can store them in a glass or Tupperware container that is air tight. Preferably avoid storing them in plastic for long periods of time. • Make sure you check the expiry date of oil before purchasing it. • Oil which has undergone rancidity should be discarded. They often have an unpleasant smell and a bitter taste. When will I know that my oil has gone bad? Opened bottles of cooking oil can come in contact with air, get oxidized and become rancid soon. Rancid foods not only taste bad, they are unhealthy too. Any food for that matter, with a significant amount of fat content such as nuts, biscuits, cakes or whole wheat flour will undergo rancidity if they are not stored under ideal conditions. Rancid foods produce an off odor and this is an indication that your oil has gone bad. To avoid this, store oil in the refrigerator. When chilled, many oils will solidify and become cloudy in appearance. This is normal and when reheated, they will return to their normal consistency and color. Do not reuse oil if the smoke point has been greatly reduced. If the oil smokes excessively before reaching 375°F, it should not be used again. Do not use oil that froths easily when food is added to it. Even with proper care, oil still has an expiry date. Before using suspected rancid oil, take a quick taste to be sure there is no bitterness or any off flavor. Choose the right fats and oils for your cooking and store them properly, rotate religiously, and discard them after the expiry date. Enjoy Cooking! !